Several weeks ago, The Globe and Mail ran an excellent piece about the challenges Canadian young people are facing as they try to get established in the careers. 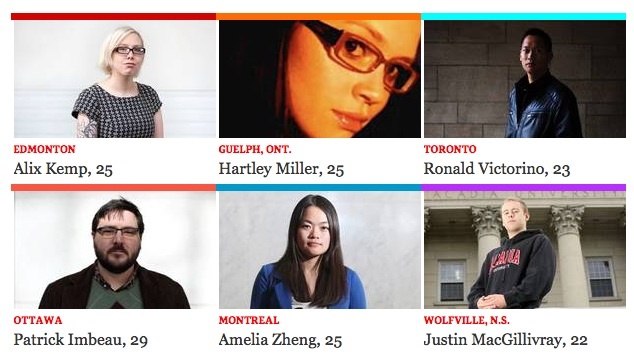 As part of that story, they created an “audio slideshow” in which six young adults between the ages of 22 and 29 describe the difficulties they have experiences as they try to get them established in permanent careers and feel like they are truly functional adults contributing to the Canadian society. Their stories are typical of those facing this generation of young people, many of whom live with their parents as a way of making ends meet (42.3% of Canadians 20-29 live with their parents according to the latest census). It’s startling to hear these young adults describe their frustration in their own voices. It’s an interesting series and well worth a listen. Click on the image below to view and listen to the audio slideshow on the Globe and Mail’s website. This entry was posted in From the adult child's perspective on December 4, 2012 by Christina Newberry.